Military forces have a long association with spaceflight, with modern rockets evolving from missiles developed during World War II. Today's armed forces rely on space-based assets for reconnaissance, weather tracking, communication, navigation and more. The U.S. Air Force regularly launches GPS and missile-defense tracking satellites, and operates two classified X-37B robotic space planes. Learn more about military satellites, space weapon, the Space Force and more here. India's recent anti-satellite test created 60 pieces of orbital debris big enough to track, 24 of which rise higher than the International Space Station's orbit around Earth. Indian Prime Minister Narendra Modi announced the nation completed a successful test-fire of its first anti-satellite launch missile, dubbed "Mission Shakti," on Wednesday (March 27). Col. Bongiovi, director of SMC's Launch Enterprise Directorate, says the NSSL program will seek to leverage the U.S. commercial launch industry. 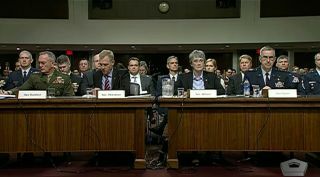 Now that the proposal has been kicked over to Congress, DoD faces what could be a harder-than-expected job communicating the Space Force plan to Congress and the public.